Dinamo Bucharest will honour the memory of midfielder Patrick Ekeng by sending the Romanian Cup to his family in Cameroon if they win the trophy. Cameroon's Ekeng died aged 26 of a suspected heart attack after collapsing on the pitch during a match on Friday. Thirteen-time winners Dinamo face CFR Cluj in the postponed final on 17 May. "If we win the final, the trophy will be sent to Cameroon, where it will be placed on Patrick's grave," said sporting director Ionel Danciulescu. Danciulescu told Romanian TV channel Digi Sport that Dinamo would ask Cluj to do the same if they win. 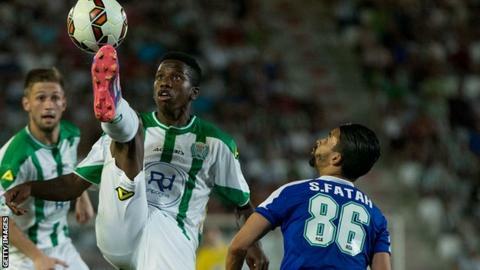 The final, due to be played on Tuesday, was postponed following Ekeng's death. Ekeng fell to the ground in the 70th minute of the televised Romanian league match against Viitorul and was pronounced dead in hospital two hours later. Two days later, Cameroon women's goalkeeper Jeanine Christelle Djomnang, 22, died after collapsing during a warm-up session.